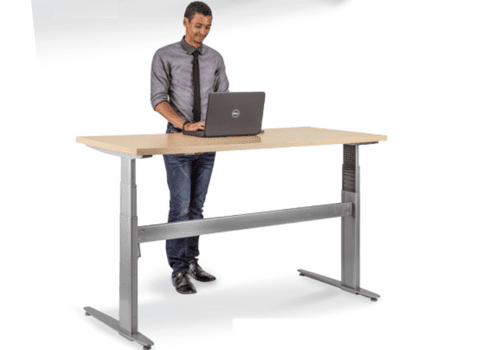 Stand height desks are designed to keep workers healthy and more productive while at work. Offering a ‘sit-stand’ experience, an adjustable standing desk can be adjusted to suit the user’s individual proportions and prefered working position. Providing added flexibility, these innovative pieces of furniture can help make workstations more comfortable and convenient. Whatever your preferred taste, this option of desking is ideal for any workspace.Whether you prefer to work seating or standing the adjustable height desk lets you choose how you go about it in order to meet your individual needs. Many of our contemporary desks are also available with matching furniture to create a collaborated look. Within our range you will find flexible height adjustable desks, as well as single and multiple table options. We also offer a variety of sizes for you to choose from. If you want to find out more about our adjustable office desks, get in touch with our expert team via phone or email. Polyprop shell on five star castor base with swivel and gas height adjustment. Choice of polished Aluminium or Black Nylon base. Polyprop shell with timber legs in choice of finishes.